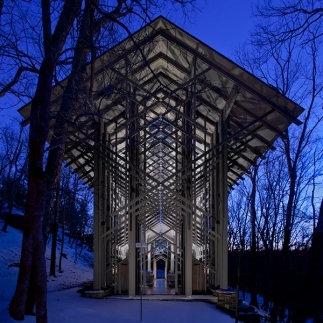 Nestled in a woodland setting, Thorncrown Chapel rises forty-eight feet into the Ozark sky. This magnificent wooden structure contains 425 windows and over 6,000 square feet of glass. It sits atop over 100 tons of native stone and colored flagstone, making it blend perfectly with its setting. The chapel's simple design and majestic beauty combine to make it what critics have called "one of the finest religious spaces of modern times." 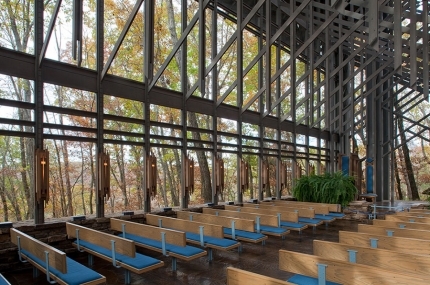 Since the chapel opened in 1980, over six million people have visited this woodland sanctuary. It has won numerous architectural awards such as the American Institute of Architects’ Design of the Year Award for 1981 and AIA’s prestigious 25 Year Award. 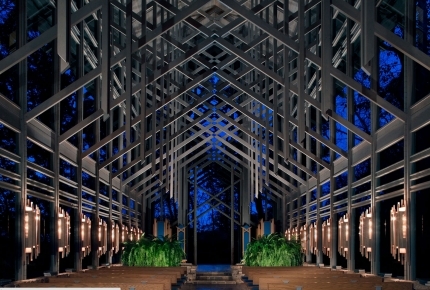 Recently, members of the American Institute of Architects placed Thorncrown Chapel fourth on its list of the top buildings of the twentieth century. Thorncrown Chapel is located on Highway 62 West just outside of Eureka Springs, Arkansas. There is no admission fee, but donations are accepted. We have ample parking for buses and RVs. So, while in the Ozarks, stop by what many have called one of the most beautiful and inspiring chapels in the world. Our secretary is in our office Monday through Friday from 9:00 AM to 1:00 PM.